I haven't had this in a long long time. It's fairly quick and super easy. Make rice in rice cooker, bake chicken and steam veggies while everything else cooks. Perfect for when you gotta bathe a toddler and have dinner on the table ASAP! Place everything in a large Ziploc bag, squeezing out all the air before zipping up. Massage and marinade for 6 hours or overnight. Place chicken thighs, skin side up, on a foil/parchment paper lined baking tray. Bake for 35 minutes. 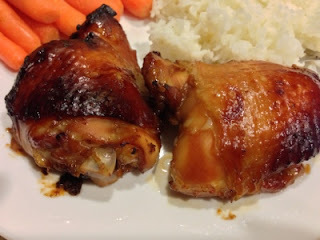 Place aluminum foil on top of chicken thighs if they start to burn. Pour marinade in a small sauce pan and simmer on medium low heat until sauce boils. 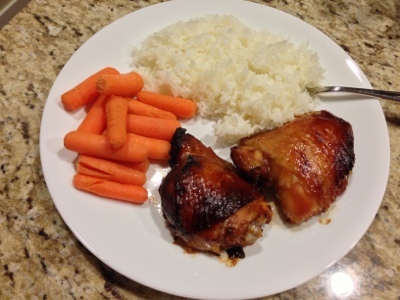 Serve chicken on rice with sauce drizzled over chicken and a side of steamed veggies. I experimented by putting a little more sugar in while simmering and accidentally ended up burning it. Teeheehee. Oh well. Lesson learned. I think I might just leave it as is or use a cornstarch slurry to thicken it up next time.